For search engine optimization, meta tags are short texts that describe the data on the page, but are not reflected in the page itself, since they are included in the code of the page or in the html tags. Meta is an abbreviation of metadata, which defines only those labels and the data contained in the page. The meta-html descriptions provide information about web pages or websites in search engines that are found in the index of these meta tags for the search results. As that you know the most important types of meta tags, you know how to write meta descriptions and you have searched for examples of meta descriptions, you may have determined that you need a good integration of seo meta tags generator 2019 that is capable of incorporating in it a meta title checker, meta description checker, and a meta description counter, then freeseosolutions meta tag generator is one window solutions for all your needs. You do not need to install the free meta tag generator or meta tag generator software on your computer, you can use it directly on the website. Control how the search engine displays its pages and results by adjusting the best and most meta description tool or meta description generators. It can help you build a seo meta description and as well as the title of the pages. This meta tag generator can also use meta keywords as a meta checker for titles and descriptions of all jobs generated by all search engines. How to Use FreeSeoSolutions Meta Tag Generator 2019? The FreeSeoSolutions meta tag generator provides you with the correct number of meta description characters because it contains the meta description length checker and the length of the title. All you have to do is complete the required fields for this purpose. Enter the desired title for your website in "Title of the site" to begin. Be sure to keep the 70 character limit. Then complete the description of 150 characters in the "Site description" box. The third box labeled "Site Keywords" indicates where you should write the meta keyword. These must be separated by commas. Then, keep in mind the box "Allow robots to index your website?". Again, another dialog asks if you want to "Allow the robot to trace all the links?". Determine if this is "yes" or "no". After that, specify "What content will be displayed on your website?" You can choose between the following options: UTF-8, UTF-16, ISO-8859-1 and WINDOWS 1252. Finally, be sure to specify "Home for your website" What is the language? "Either in English or in any language you like, it also includes optional meta tags. You can set the number of days after the search engine verifies the page. If you prefer, please include the author's details. If you have completed all of these elements, click on the Generate Meta tags button. 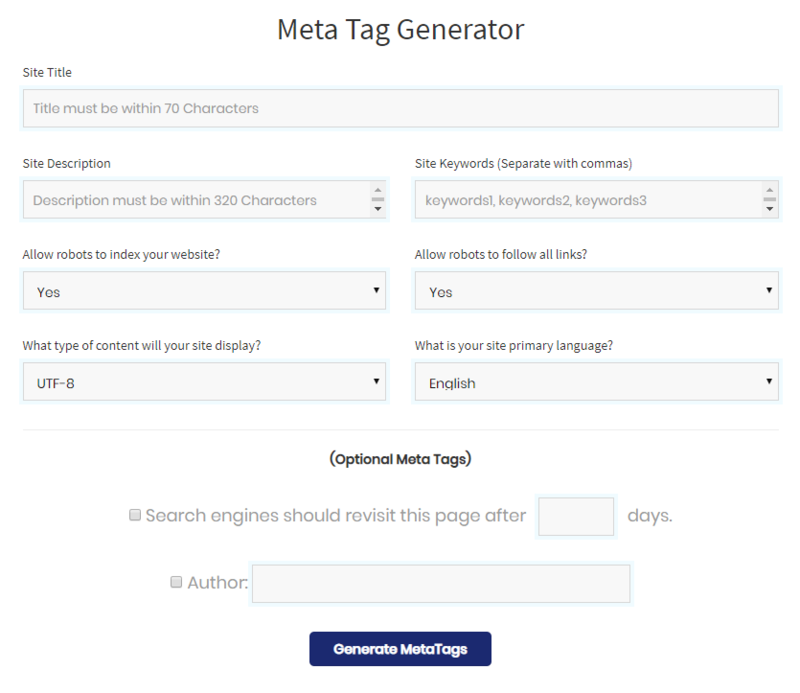 When you use this free Meta tag generator, follow the steps below to create an optimization page.